This edition is LIMITED to ONLY 40! 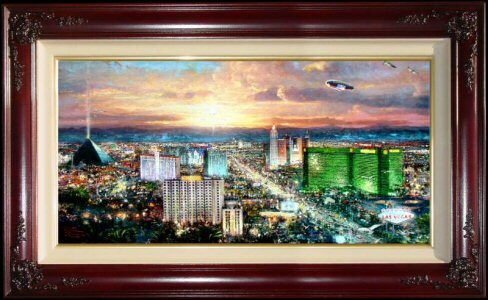 "To create a vision of the Las Vegas skyline, all I needed to do was take a plane ride. As I was swooping into Las Vegas during a recent road trip, I instructed the pilot of the small plane we were aboard to take an extra pass just above the Las Vegas strip. The sun was setting and the light was perfect. The view that lay spread before me became my painting Viva Las Vegas. I never tire of visiting Las Vegas, the city of endless excitement and dazzling lights. In my visual re-creation, my goal was to emphasize the light and take dramatic liberties with the skyline itself. The pools of color that draw your eye to the different areas of the composition are like focused stage lighting in a vast theater. Of course I had to include the famous “welcome sign” that has greeted so many millions of visitors to Las Vegas over the years. The major hotels of the strip are also clearly in evidence. New York, New York stands proudly in the mid-distance (see if you can spot lady liberty holding her torch high) and at the left the famous Luxor pyramid shoots its beam of light skyward. I also included a wedding chapel (a reference to one of my earlier paintings) and several other hidden details worth spotting. Diligent collectors can play the “name game” and spot the references to famous headliners who have delighted visitors to Vegas over the years. Using a special “micro detail” under-layer, I included references to Frank Sinatra, Celine Dion, Wayne Newton, Don Rickles, Liberace, and countless others. Can you find them? But the real star of the show is the dramatic desert sky and the brilliant colors of this desert oasis. I utilized a radiant palette filled with the luminous colors that Vegas is famous for. 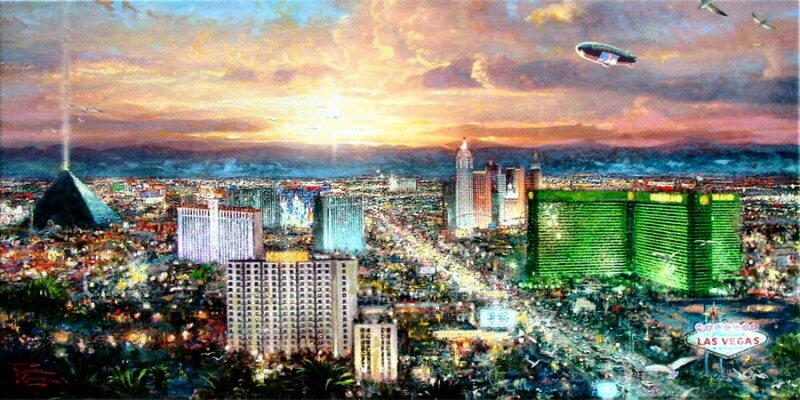 Like memories of a whirlwind Vegas weekend, Viva Las Vegas is alive with excitement."